Draw out your snowflake design on the bag using a pencil. Trace a circle around a drinking glass for the center and draw out straight lines from the center. 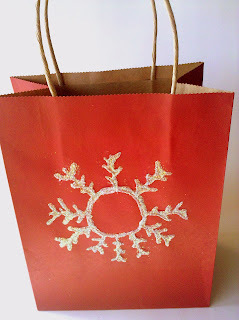 Slip a piece of wax paper in the gift bag to protect the other side. Trace the pencil marks with tacky glue and sprinkle with glitter before it dries. 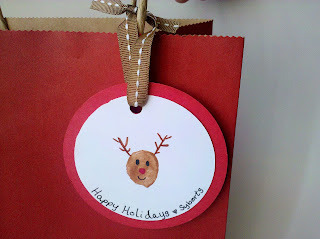 Add a thumb print reindeer gift tag for a sweet personal touch. Do you personalize your gift wrap? I would love to hear about your ideas! I haven't ever personalized wrapping paper, but I have stamped tissue paper before. I typically do this when I am giving a wedding present so that I can match the colors of the wedding. I have also done it for baby showers to match either the decor of the room or with pink or blue feet and hand prints.